Mark Allen progressed to the second round of the World Open in China after his match with Ryan Day was interrupted by water leaking onto the table. The match was tied at 2-2 when condensation started dripping down from the roof at the Hainan International Exhibition Centre on Hainan Island. Officials climbed a large ladder to find the source, before the part of the table affected was dried out. 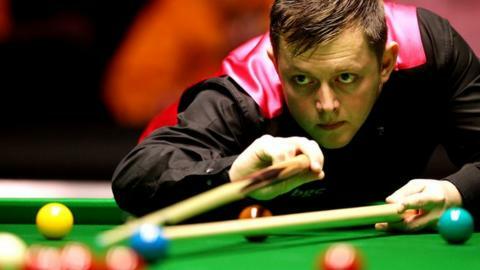 World number nine Allen won the next three frames to wrap up a 5-2 win. The Northern Irishman is the defending champion after winning his maiden ranking event at the tournament last year. Prior to that, Allen was critical of the venue, describing conditions as "horrendous". Welshman Day led 2-0 early on but failed to capitalise on chances to go further ahead before Allen proceeded to win five frames in a row. He will next play Robert Milkins, a 5-3 winner over Mark Davis. World number four Shaun Murphy came from 4-3 down to beat Martin Gould 5-4. Murphy rattled in a 118 break to level at 4-4 before edging a tight decider. He will play Matthew Stevens, who came from 3-1 and 4-3 behind to overcome David Gilbert, in the second round. Judd Trump, who has returned to world number one after reaching the semi-finals of the last ranking tournament - the Welsh Open - earlier this month, thrashed Mark Joyce 5-0. Trump, who surprisingly lost 6-5 to Joyce from 5-2 up in the first round of the UK Championship in December, won the opener with a break of 66 and snatched the second on the black with a 35 clearance after Joyce, ranked 49, was first in with 69. Further runs of 56 and 49 saw Trump take the next two before wrapping up a comfortable victory. He will play Nigel Bond, who received a walkover after Ali Carter was not well enough to travel to China, in the second round. Neil Robinson beat Dominic Dale - who damaged the tip of his cue when 2-0 down, causing a delay to their match - 5-2 to progress to a second-round match with Graeme Dott, a 5-2 winner over Jamie Cope.